The input element is a component allowing the visitor to introduce some data, generally in a form. HTML name is the internal name for the element in the generated code (name attribute in input element); there is a default name, but if the containing form sends data to an external processing it may be useful to fix it. 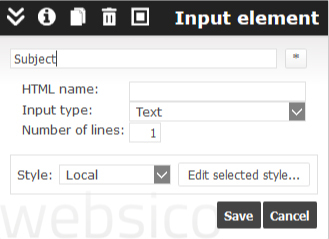 The default input type is a one line text and can be changed to a number, dropdown selector etc. The first field which type is text, number or selector wille be taken as object field for the message sent by the form.